New Custom Wood burning Fireplace installed in existing home in Williamsburg, Va. Accent fencing has been installed with privacy fence to follow. A 6′ tall wooden privacy fence will be installed at the rear of this beautiful home to add to the private, relaxing atmosphere. 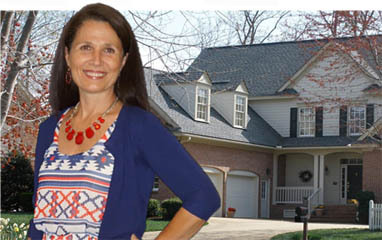 Stop by and see how large the inside of this 2 story Colonial actually is. BRAND NEW! $359,700. 1st Floor Master Bedroom Suite. MOVE-IN Ready! NO HOA!! Realtors are welcome! 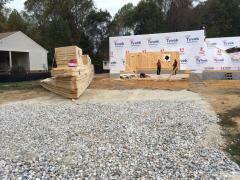 Come by and see this new home. This Cape Cod home is loaded with features. 3-4 bedrooms, Master Suite on the 1st floor, 2-1/2 baths and 2 car garage w/opener, 9′ ceilings. Wide plank flooring thru-out the 1st floor with LED recessed lighting and lots of natural light as well. Large open kitchen with a large island, including a 5 person raised bar, topped with Quartz counters, glass back-splash. Double vanity w/ quartz tops in master bath w. 5′ shower w/ glass door. Extra floored storage (6′ x 26′ accessed from hallway) Large Bonus room (16′ x 20′) w/ recessed lights and ceiling fan. Fully enclosed backyard with 6′ tall privacy fencing and gates. Too many features to list, this is a must see! Call Kim Griffith 757-880-9321 for more info or a private showing. Presenting 2888 Sandy Bay Road Williamsburg, VA 23188 for $369,500 .44 Acre. Brand New Custom home is Move-in ready. This spacious new home with 9′ ceilings on the 1st floor provides 3-4 Bedrooms w/ Master Bedroom on the 1st floor, Large 16′ x 20′ Bonus room, 2- 1/2 Baths, 1- 1/2 Stories. Large closets and 60′ of floored walk-in storage on the 2nd floor. 2 car garage w/ opener and remotes. Many upgrades are included. Granite and quartz on all counter tops, Large Island with raised bar, GE Stainless steel appliances w/ Counter depth french door refrigerator included, Plank flooring thu-out 1st floor and upstairs bathroom, open oak staircase with rear entry, 9′ French door, recessed LED lighting thru-out, 2 HVAC units (1 downstairs, 1 upstairs w/ separate T-stats), 5′ shower w/ glass door, laundry room w/ deep sink. Lifetime shingles, maintenance free exterior w/ limestone steps and aggregate walkway and stoop. Call for additional information. 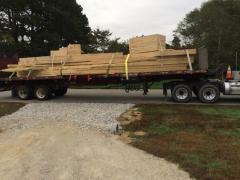 For showing call 757-880-9321 Kim Griffith, Kimberly Builders, Inc. 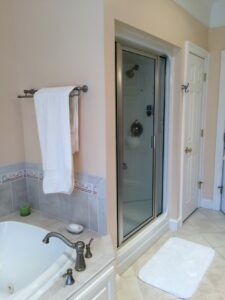 I had a blast helping Carl and Judy update and reconfigure their master bathroom. See the “Before pics” at the bottom of the post. The double vanity and tower existing was great, no need to do anything to this side of the bathroom. 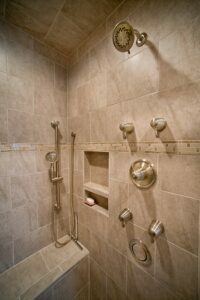 Their issue was a small fiberglass steam shower that wasn’t comfortable for Carl. Also the loss of space with the steam motor in the linen closet adjacent to the shower was a huge waste of space. 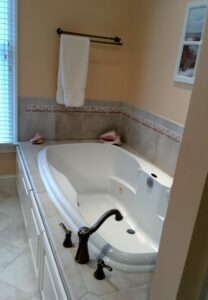 The jetted tub looked a bit dated and the whole right side of the bathroom needed to go! So here are some before pics to give you the idea of what they had and some afters to show what can be done to capture wasted space and turn it into a luxurious have of rest and spa-like atmosphere. 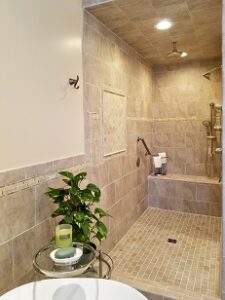 Professional pics will follow of the full spa walk in shower with body sprays, rain-head shower-head , multi-functional shower-head, bench with handheld shower wand. The existing floor remains and a stone and glass transition was added to marry the new floor to the existing. Notice the new porcelain tile is a bit darker to help offset the stylish free standing “Lyndsey” acrylic soaker. We also placed a stone mosaic as a focal point centered in the shower at the glass panel.